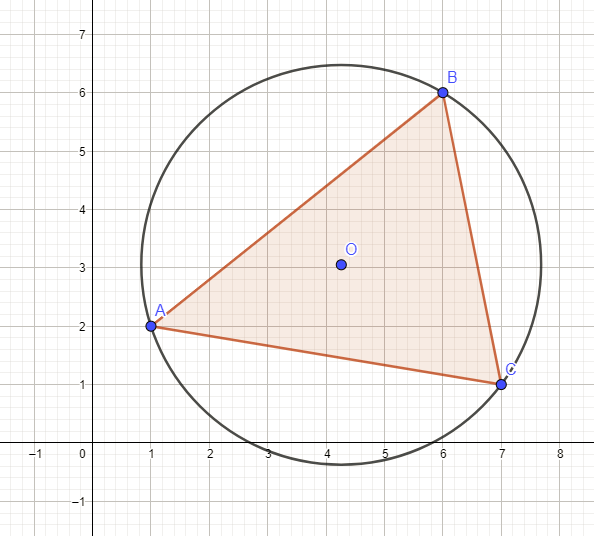 A triangle determines several mathematically significant points, including its circumcenter, its centroid, and its orthocenter. If the triangle is not equilateral, then those points are distinct and determine a line, known as the Euler line, which is typically represented using trigonometric, vector, or parametric notation. Here a formula for the Euler line is derived using the Cartesian coordinates of the triangle. In two-dimensional Euclidean geometry, any triangle determines many points that are not necessarily contained in the triangle's three vertices and three sides. 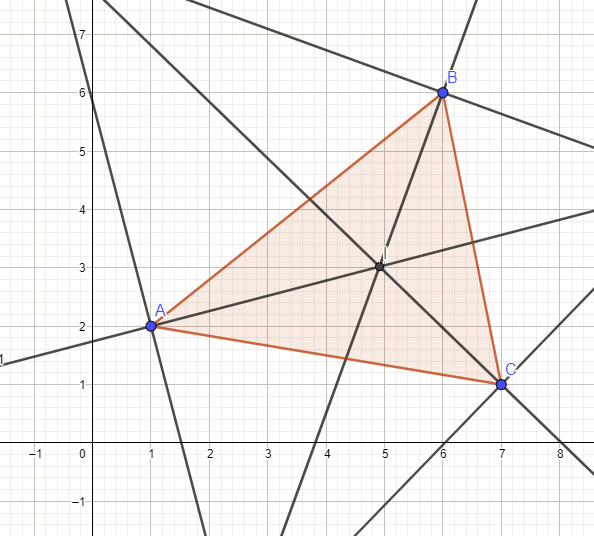 Among these are the circumcenter, the centroid, and the orthocenter. If a triangle is equilateral, then all of these points are the same point and therefore do not determine a line. However, if the triangle is not equilateral, then the points are not identical and have the remarkable property of being rectilinear. This containing line is named in honor of the famous Swiss mathematician Leonhard Euler, who demonstrated its existence in his 1765 work Solutio Facilis Problematum Quorundam Geometricorum Difficillimorum , which was part of Novi Commentarii Academiae Scientiarum Imperialis Petropolitanae, Volume 11 . A triangle's circumcenter, usually denoted as `O`, is the center of the single circle that passes through the triangle's three vertices. A triangle's centroid, usually denoted as `G`, is the intersection of the triangle's three medians, each of which is a line segment from a vertex to the midpoint of its base, which is the side opposite that vertex. The centroid is also known as the medicenter. From a physics perspective, if the triangle were a solid object of uniform thickness, then the centroid would be its center of mass. A triangle's orthocenter, usually denoted as `H`, is the intersection point of its three altitudes, each of which is a line segment from a vertex orthogonally to the altitude's extended base, which is the line through the side opposite the vertex. 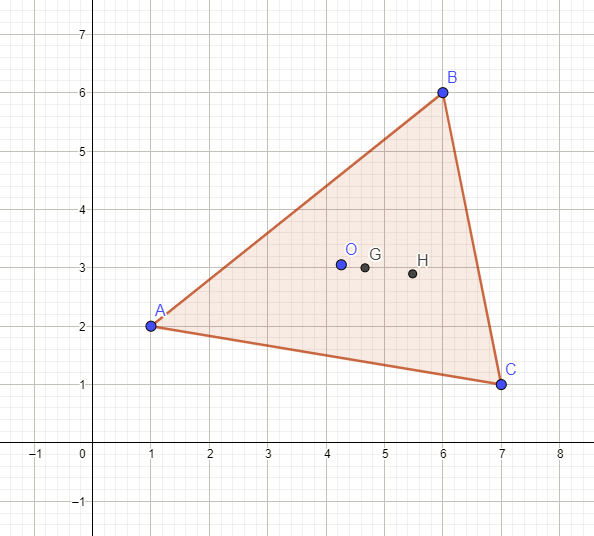 These three points — the circumcenter (O), the centroid (G), and the orthocenter (H) — can be plotted for any triangle. The rectilinear nature of the three points — at least for the example triangle with the coordinates (1,2), (6,6), (7,1) — is obvious. As noted earlier, these points define the Euler line. 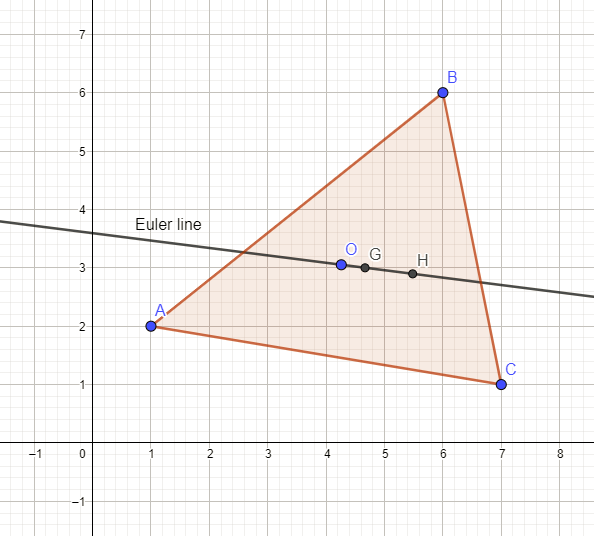 Before deriving a formula for the Euler line based on its Cartesian coordinates, it can be noted that not all mathematically significant points of a triangle lie on the Euler line — for instance, the incenter, which is the intersection point of the angle bisectors of a triangle. 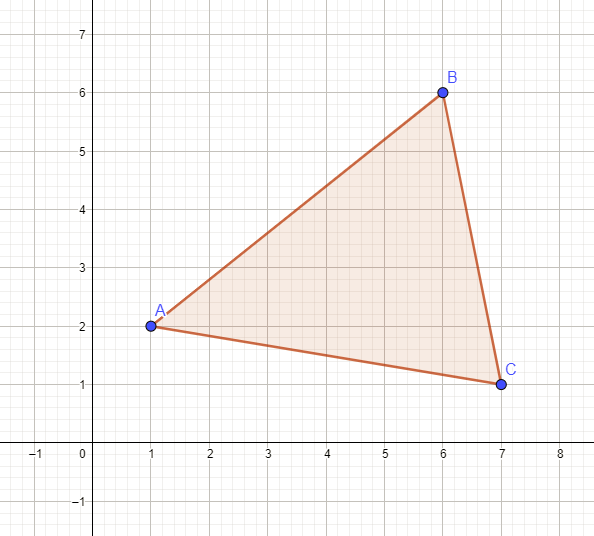 The point is usually denoted as `I` and is equidistant from the sides of the triangle. The incenter, in this case, may be close to the Euler line. However, the incenter is not on the Euler line, as proven with this single exception. A Cartesian representation of the Euler line can be derived using the formulas for any two of the three points detailed above. The brevity of the centroid formulas makes it an obvious first choice. 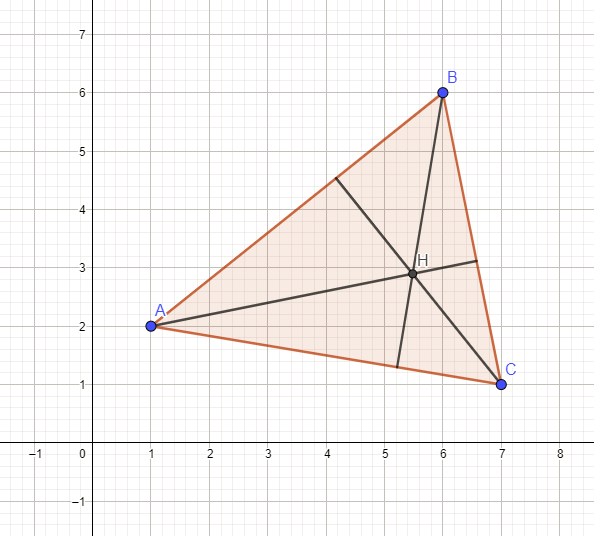 The circumcenter formulas are shorter than those of the orthocenter, and hence the former will be the other point used here. 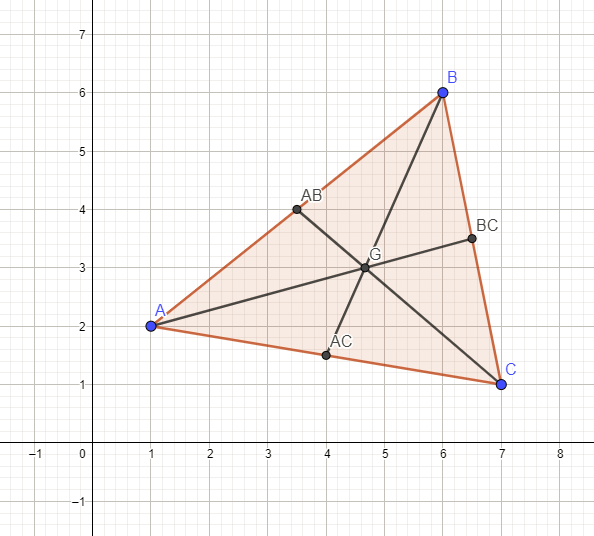 This line has a slope of -0.12676056 and intersects the y-axis at 3.5915493, which matches the line seen in Figure 6. Copyright © 2018 Michael J. Ross. All rights reserved. Thank you for all of your valuable help with this. Michael, it has been a pleasure for me as well, and I am quite sure you will be hearing from me again very soon.